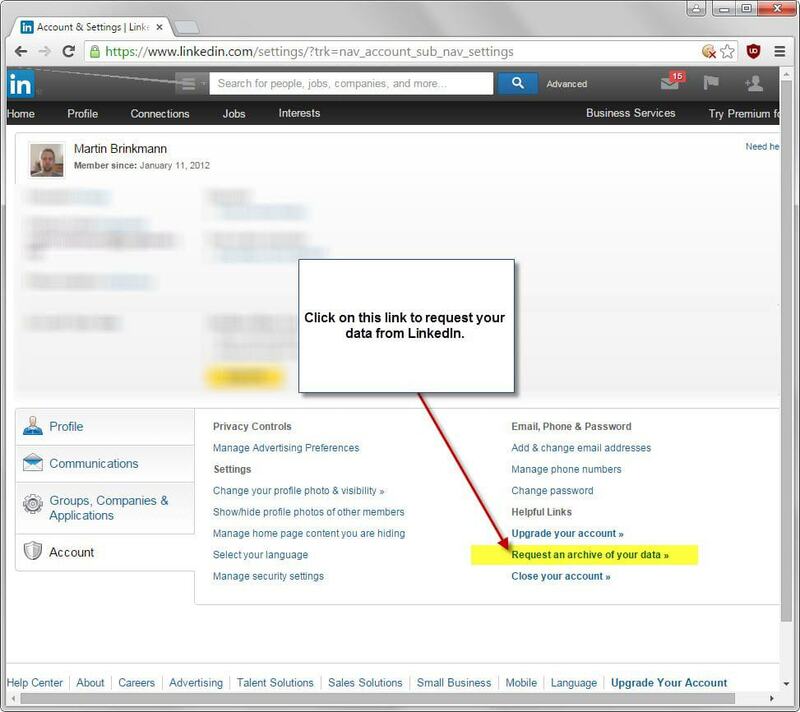 LinkedIn modified the option to export contact information on the social networking site recently. Contacts, or connections as that is what they are called on LinkedIn, define business relationships but also friendship on LinkedIn. You can check out your existing connections as well as invitations and suggestions easily on LinkedIn. While it is easy to add new connections to LinkedIn, either directly or by using third-party services to import contact lists, it has become difficult to export the connections again. Update: LinkedIn has reinstated the original contact export tool for the time being. All you had to do previously was to click on an export link in the LinkedIn interface to do that. If you try that right now, the link is still there, you are redirected to a Help page explaining the new process. According to it, you may request an archive of your LinkedIn data from the company that includes updates, IP records, searches, contact information and other data. The page lists all information that the archive includes. This process takes up to 72 hours before it completes, and you will receive an email that provides you with information on how to download the newly created archive. The easiest way to get to that page is to open the main account management page https://www.linkedin.com/settings/?trk=nav_account_sub_nav_settings and switch to account on it. There you find listed the option to "request an archive of your data". This leads to a page with additional instructions and a request data button that you need to click on. Once you see "request pending" you have successfully requested the archive. As mentioned earlier, it may take up to 72 hours before you are notified by email that your archive is ready for download. The removal of the old export option has been confirmed by an official Twitter account of the company. It is unclear why LinkedIn made the change. While some might think it has something to do with keeping users on the site, it could simply have been part of an effort to remove code and features from the site that are not often used. While LinkedIn users may get the archive earlier than 72 hours, the new approach is everything but user-friendly. The social networking site LinkedIn has made it difficult to export contacts (connections) from the site. Wow, thats just asinine of them. They will import all your data wholesale from all of your email clients and servers but won’t allow you easy access to the data you provided them? Ummm .. clear as anything can be! Exporting contacts allows the user the option of not using linkedin for communicating with their contacts. I get people spamming me with this LinkedIn crap (I pronounce it Link-din where the last i is a schwa sound) it’s a service or tool that honestly needs to die. There are better ways of giving people your credentials etc. Time for people to start requesting a file a day. Let’s make it as inconvenient to them as they had made it to us.